Need Facility management services in Gurgaon. 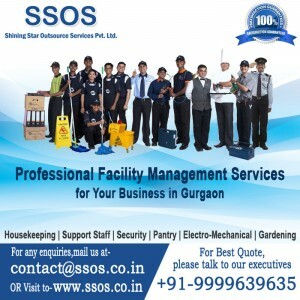 Best Facility Management Company in gurgaon Call SSOS for best competitive prices. Save your time and money on routine task of organization but they are not main. Task like Housekeeping, Security, Gardening, Electro-mechanical, Pantry, Plumbing etc. are managed by SSOS team and give complete satisfaction to client. We are professional facility management provider in gurgaon working towards the creation and maintenance of an optimal working environment. Total commercial facility management solution is provided by us to meet your needs. We are effective and efficient facility Management Company in gurgaon. Get cost effective solution for business growth from SSOS. So contact us today for reliable and quality services. Shining Star Outsource Services Pvt. Ltd.